In Bend, and throughout the Pacific Northwest, hops hog the spotlight. It is an understandable phenomenon. The lush Willamette Valley is home to a healthy collection of hop farms. And nearby breweries in Washington and Oregon produce some of the best IPAs in the world. Hops deserve high praise. But let's also give credit where due: malt is a beer's backbone. 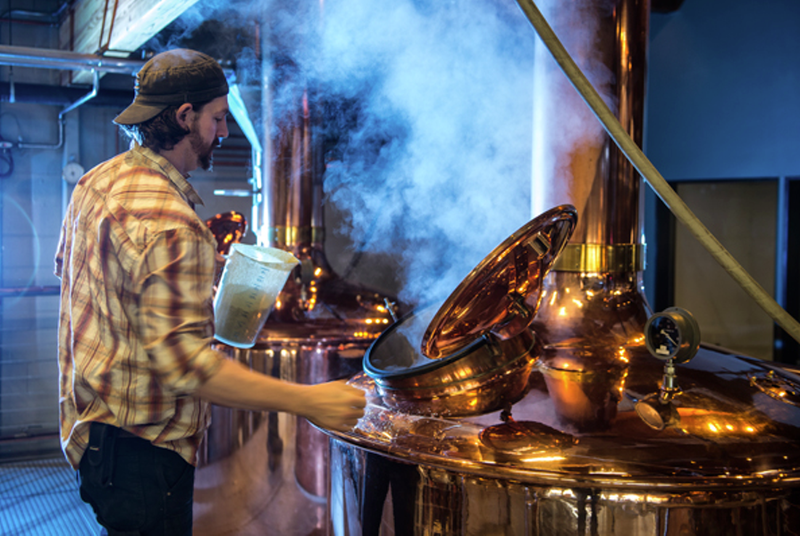 "In brewing school they teach you malt is the soul of beer," said brewing guru Larry Sidor. "I love malt aromas as much as I love hops." Today Sidor is Crux Fermentation Project's co-owner and brewmaster, and in the two years Crux has been open Sidor has cranked out a number of memorable, malt-heavy beauties. As a whole, and despite its newcomer status, Crux is making some of the most exciting and most significant beers in the state. 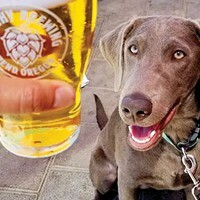 For eight years Sidor acted as Deschutes Brewery's brewmaster and spearheaded a number of now-classic brews, including Red Chair Northwest Pale Ale, Inversion IPA, The Dissident and The Abyss. Before Deschutes, he logged 23 years at Olympia Brewing Company. Sidor, who is disarmingly modest, knows beer better than most. And he remains wildly enthusiastic about his craft. Malting, Sidor explained, is the process where you tell the seed of a cereal grain that it's springtime and it's time to germinate. 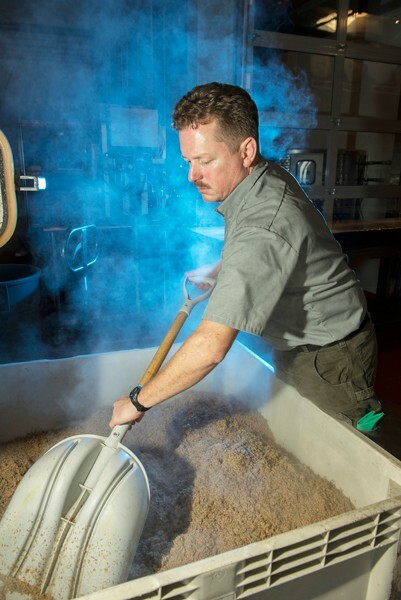 Once the grain sprouts, brewers apply heat and dry the grain out, a process that generates sugar and enzymes. From there, Sidor said, the resulting flavor profile depends largely on how hot you heat the malt when you're drying it. Malted barley is the grain most people associate with beer—and what Sidor often uses in his richest, darkest beers—but all sorts of grains can be used, including rice, rye, spelt and wheat. And malts, like hops, are available in countless variations. Sidor is currently sitting on 40 malt varieties from all over the world: Germany, Belgium, Finland, Canada and Washington. "I do a lot of Belgian beers so I use a lot of Belgian malts, because they give me that traditional Belgian taste," Sidor said. Malt taste can vary widely, too. 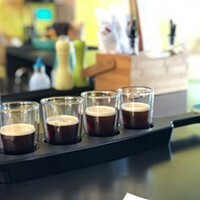 Depending on the malts used and the intensity and duration of the baking, malts can impart amber flavors, but perhaps most famously, chocolate and coffee flavors. "The more you heat it, the more caramelization takes place," said Sidor. Malts not only affect taste, but also appearance. Heavy malts are what give dark beers their classic color. "Without black barley and malt, it won't be a stout," Sidor said. And malts are as flexible as a master yogi—malted grains are crucial for beers, as translucent as a true pilsner and as black as the boldest imperial stout. Crux's lightest, least-malted beer is the thirst-quenching Prowell Springs Pre-Prohibition Lager, a refreshing 5.1 percent alcohol-by-volume brew meant to mirror the type of American lagers that existed before the government put the kibosh on beer. It's made using 60 percent two-row malted barley, 35 percent six-row barley (when a barley plant grows, some grow with kernels six to a row while some only have two) and 15 percent corn. Sidor pointed out that the nation's largest macro brewers typically use six-row barley because it is less flavorful. Unfortunately, many Americans were raised on tasteless, fizzy, yellow beer. Since traditional, two-row malted beers were too strong and often off-putting to Americans, brewers started adding corn to their lagers to mellow the taste. A good lager, Sidor said, should have a light mouth feel and be quite pale in color, but not short on flavor. On the exact opposite end of the malt spectrum are bodacious beers like Crux's Tough Love Imperial Stout—the brewery's heaviest, most malted concoction. Not only does Sidor roast the hell out of the malts, he uses roasted black barley as well. And that sour beer that's got you all worked up? It too relies heavily on malts. Whether it's a sour that utilizes a brettanomyces yeast (colloquially referred to as "Brett") or one that leans on acidic malts, called acidulated malt, sours like Crux's insanely popular Flanders Red make good use of malts. "The best sour beers have an explicit malt structure that the Brett can really play off of," Sidor said. Keep your eyes peeled—in mid to late March Crux will release its latest sour, a Brett beer called Better off Red. "It's all about the malt," Sidor reminded.